Tamberly Conway holds a B.S. in Wildlife Management from McNeese State University. She received a M.S. 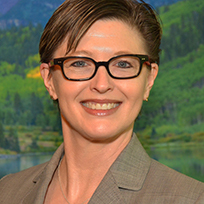 in Forest Recreation Management, and a Ph.D. in Forestry, with a focus on Human Dimensions in Natural Resources and dissertation focus on An Assessment of Natural Resource Outreach and Conservation Education Program Preferences for Latino Audiences, from the College of Forestry and Agriculture at Stephen F. Austin State University. Tamberly serves as a Partnerships, Diversity and Inclusion Specialist, for the Conservation Education Program at the USDA Forest Service in Washington, DC. She received the 2012 USDA Forest Service Chief’s Engaging Urban America Award: Urban Connections—Latino Legacy Program, and the 2015 USDA Secretary of Agriculture Lincoln Award for Diversity and Outreach. Her work focuses upon creating traditional and non-traditional partnerships in conservation education and community engagement to reach diverse audiences with meaningful and relevant educational and stewardship opportunities. She has been engaged in the health and nature realm for over 10 years, through a variety of unique partnerships. She serves as an Association of Nature and Forest Therapy Guide in Training and is interested in improving relationships between the land and people. Tamberly believes the power of diverse partnerships, youth engagement and collaborative envisioning are key factors to success in serving diverse audiences nationwide. Christy was born and raised in the northeast Indiana countryside, granddaughter into two large local farming families. She has always had an affinity for the land in Indiana; the farmland, the gardens she tends, the orchard on her land, time hiking with family, but also her escapes to the mountains, where her beloved pines grow. She grew up playing piano and violin, singing and performing for churches and organizations local and abroad in Europe. Her early college studies included German and Vocal performance. She homeschooled her four children for 12 years starting in 2004, loving the constant opening to curiosity about the world that was bubbling out of them. Those years spent with them guided her to her work in forest therapy in many ways. 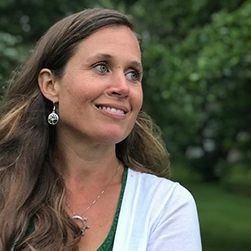 As a mom, with the normal events of childhood illness and fueled by the desire to do the best for their growing bodies, she began an in-depth study of herbal medicine and alternative therapies. Plant medicine continues to be the major source of healing for her and her family. Allowing her child’s mind to arise again and following her own healing journey guided her to ANFT in 2016. As a musician, she has taught violin and piano for nearly three decades and performed with many area orchestras. She plays with a string quartet and currently administers her music program through the local YMCA, teaching violin, viola, guitar, piano, cello and voice lessons, employing local teachers. During her practicum, she enrolled in school studying Environmental science and Religious Studies. There, she discovered that her spiritual journey found a grounding. She plans to earn an MDiv in Theology starting in 2020, with her focus and research in eco-theology, a branch of feminist theology allowing her focus on her understanding of healthy embodiment and the connection to the divine’s embodiment in the more-than-human world. She is thrilled at the opportunities being a guide has brought to her life. The way it has called out medicines in herself that were laying dormant has been a great exercise in self-compassion and gratitude. The growth has not been painless, but has been truly worth it, especially as she has the fortuity to share in other’s journeys as well, supporting them in their own work, as a friend, mentor and teacher.